A suspenseful recounting of the torpedoing of the USS Strong in the South Pacific in July 1943 and one soldier’s subsequent eluding of capture on the Japanese-held Solomon Islands. An author who knows how to tell an exciting war story, Military History editor-in-chief Harding (Last to Die: A Defeated Empire, a Forgotten Mission, and the Last American Killed in World War II, 2015, etc.) delves into the incredible survival tale of Lt. Hugh Miller after the Strong was struck by a Japanese torpedo in a brief bombardment engagement in the Kula Gulf on July 5, 1943. The lethal engagement occurred during the American thrust to retake the Solomon Islands; Guadalcanal had been seized by the Americans in January, and the Strong was part of Task Group 36.1, whose mission was to create havoc in the Kula Gulf so that American forces could make an amphibious landing on New Georgia. As the ship went down, former college football star Miller was one of the last to vacate the ship. While a nearby ship picked up the rest of the crew, Miller and several others were blasted unconscious by the detonation of the sinking ship’s depth charges. Adrift on a floater net they had caught, the shipwrecked men washed ashore on Arundel Island a few days later, barely alive and suffering from oil ingestion, sunburn, and dehydration. 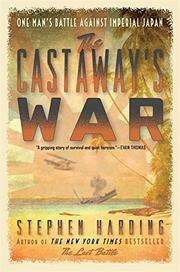 From this point, Harding builds the suspense with intricate detail—and refreshingly, without, phony dialogue—of finding refuge, water, and food (coconuts) to sustain them, though several of the men died immediately. As their superior, and knowing he was severely wounded, Miller ordered the three survivors to take off toward New Georgia and leave him to die—or so he believed. However, Miller gained strength and used his hunting skills to avoid capture by the constantly patrolling Japanese; while hiding and prowling, he even collected intelligence as he prayed for rescue. An amazing journey through adversity and desperation.